FEBRUARY 11--As they continue to wrestle with feelings of obsession, lust, and envy directed at Alexandria Ocasio-Cortez, conservative detractors have toggled between portraying the new congresswoman as a Westchester “elitist” who is secretly wealthy and a poor undeserving of appointment to the powerful House Committee on Financial Services. Previously, conservative bloggers have claimed that the freshman lawmaker was an Ivy League product and “Yorktown elitist” whose father was a partner in a thriving architecture firm. In fact, Ocasio-Cortez graduated from Boston University and lived in a Westchester town that her critics--who likely have never stepped foot in the county directly north of the Bronx--believe is an equivalent to ritzy Scarsdale or Rye (and not Yonkers or Mount Vernon). 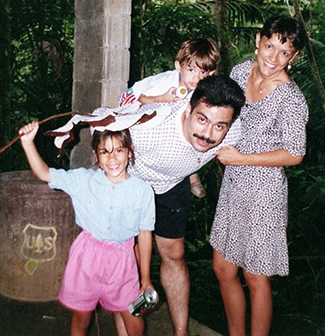 Though headed by a white-collar professional, Ocasio-Cortez’s family (seen above in a mid-90s snapshot) was middle class-adjacent and not unfamiliar with significant financial pressures, a situation with which many American families can relate. An examination of court, real estate, and tax records contradicts many of the smears targeting Ocasio-Cortez’s upbringing and financial position. When Ocasio-Cortez’s father Sergio died of lung cancer in September 2008, he left behind no stocks and bonds, annuities, or insurance policies, according to a Surrogate’s Court filing signed by his widow Blanca. Ocasio-Cortez, then 18, had just begun her sophomore year at BU when her father passed away at the Memorial Sloan Kettering Cancer Center in Manhattan. In a handwritten October 2008 court filing, Ocasio-Cortez’s mother listed Sergio’s Bronx condo as his sole piece of real property, failing to include the Yorktown Heights residence for which he was the sole owner. In a final asset inventory prepared by Blanca in 2012, the Westchester home is listed and valued at $300,000, while two autos are said to be worth $20,000. The Bronx condo, however, is not included in the disclosure, which Blanca apparently prepared without the assistance of a lawyer. A second Bronx apartment--jointly owned by Sergio and his business partner and used as their office--was also not disclosed. These omissions, however, did not carry any tax implications due to the modest value of Sergio’s estate, which included a pair of mortgages on the family’s Yorktown Heights residence (which was purchased when Alexandria was two years old and her brother Gabriel was a year from being born). The MBE designation is given to firms whose stock--at least 51 percent--is owned by members of designated minority groups. While an MBE company is not guaranteed public or corporate work, government entities often include mandated “set asides” for these firms, while many private sector companies look to MBEs to help fulfill diversity goals. 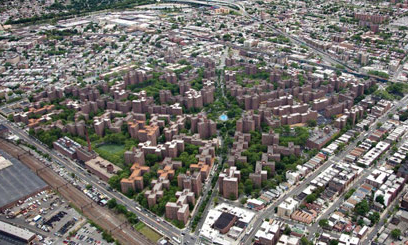 In addition to handling inspection and repair work for Parkchester’s South and North divisions, Ocasio-Roman’s clients included developers and managers of low income housing, like the Mount Vernon Housing Authority and Promesa, a Bronx social services agency. The architect’s not-for-profit clientele, however, was not making him rich. Billing records show that Ocasio-Roman charged $65 an hour for his consulting services. Ocasio-Roman’s office was a few blocks from the Parkchester South apartment he bought in June 1986 for $36,000. He financed the purchase of the 725-square-foot Unionport Road residence with a $32,100 mortgage carrying an interest rate of nearly 12 percent. In December 1991, shortly after Alexandria turned two, Ocasio-Roman closed on a $153,000 starter home in Yorktown Heights, 30 miles north of the family’s Bronx apartment. Built in 1927, the Longvue Street residence (pictured below) sat on nearly half-an-acre of land and had three bedrooms and one bathroom across its 961 square feet. Ocasio-Roman put up 25 percent of the purchase price in cash ($38,250) and financed the balance with a $114,750 adjustable mortgage that carried an initial rate of 6.25 percent. Within 18 months of purchasing the Yorktown Heights home, Ocasio-Roman’s finances appeared strained, according to public records. He stopped paying the monthly common charges for his apartment in May 1993, prompting the Bronx condo's board to file a lien seeking payment of 17 months worth of arrearages. The architect fell so behind on the apartment’s mortgage payments that Citibank moved to foreclose on the loan. When unpaid principal, overdue interest, and late fees were tallied, the architect owed the bank more than the mortgage’s original amount. However, despite a court-ordered foreclosure judgment, Ocasio-Roman somehow kept the bank from seizing the Bronx condo. During this period, Ocasio-Roman added to his real estate portfolio when he purchased with his partner a second Parkchester South apartment for $25,000 cash (the unit was used as their office). Over the following years, Ocasio-Roman and his wife were served with three separate judgments--totaling about $10,000--from the New York State Department of Taxation and Finance. Each of the warrants was eventually satisfied by the couple. Additionally, the architect and his business partner were hit with two separate liens for failure to pay more than a year’s worth of common charges on their office space. Months before his daughter went off to college, Ocasio-Roman got a $100,000 home equity loan against the family’s Westchester residence. It appears he used part of the variable rate loan (which started at 8.25 percent) to pay off the mortgage on the Bronx condo he financed years earlier with an onerous 11.875 percent loan. When he secured the home equity loan in December 2006, Ocasio-Roman still owed about $85,000 on the property’s first mortgage. The combination of her father’s death and the 2008 global financial crisis, Ocasio-Cortez has said, left her family in perilous financial condition and struggling to keep their home. While county records do not indicate that lenders filed to foreclosure on either of the Westchester property’s two mortgages, the issuance of any default notices would not have been publicly revealed. The mortgage-free Unionport Road apartment has been Ocasio-Cortez’s post-college home. It is where she is registered to vote from and where the activist filmed part of her stirring Democratic primary campaign video. The deed to Ocasio-Cortez’s apartment remains in her late father’s name, while the quarterly property tax bill is now mailed to her mother’s new home north of Orlando, Florida. In February 2013, the Parkchester South board filed a $2003 lien against Sergio for unpaid common charges. An August 2016 filing by the City of New York indicated that a $5174 lien had been placed against the Bronx condominium for unpaid property taxes and related fees and surcharges. The municipal lien identifies Sergio Ocasio as the apartment’s owner. 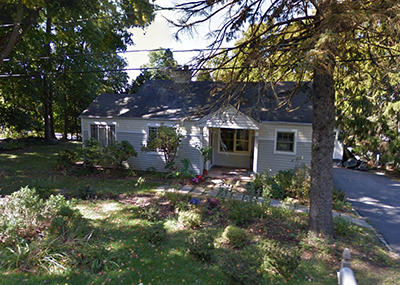 Ocasio-Cortez’s mother remained in the Yorktown Heights home until late-2016, when the family sold the residence--which they had recently spruced up--for $355,000. The deed was signed by Sergio’s widow and his two children. With part of the sale proceeds, the family paid off the balances on the property’s two mortgages. The settling of Ocasio-Roman’s estate did not require a public accounting of how its assets were distributed. 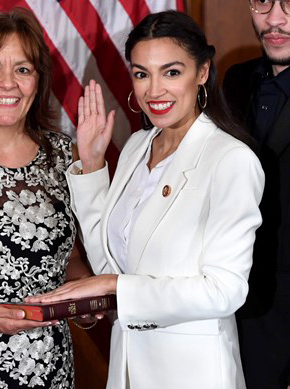 Two months after selling her Westchester home, Blanca Ocasio-Cortez--who cleaned houses and did other odd jobs to support her family--purchased a new house in Florida (where she works as an office clerk at an elementray school). The 864-square-foot residence has two bedrooms and cost $87,000. The sales price was actually $3000 less than when the home last sold in 2004. In a financial disclosure form filed last year, Alexandria Ocasio-Cortez reported limited savings and small brokerage and 401k accounts. Her student loan debt falls somewhere between $15,000 and $50,000. She has fretted about being able to afford an apartment in Washington, D.C., where the median rent exceeds $2500.